The partial rollback of the Bush tax cuts, the health reform tax hike, and the threat of yet more tax increases have induced what you would call tax policy uncertainty. Add in regulatory uncertainty and you have a recipe for a serious lack of job-creating capital investment, which, like (go figure) job growth, has been anemic of late. So perhaps the 1 percent aren't the only ones who've lost some "important" policy battles. I wonder how the whole inequality narrative would play against a healthier employment backdrop? Now, if you read Krugman's article, and happen to consider yourself a "progressive", you'll take issue with my issue. You'll chastise me for not pointing out that Krugman is mainly targeting Wall Street "wheeler-dealers". And while you'd be right (mainly), I'd chastise you back for not acknowledging that, per the above excerpt, the scope of his disdain indeed encompasses "the very rich" beyond Wall Street as well. And, besides, the tax hikes were not targeted at merely the Wall Street rich---and the financial industry is clearly not the only one suffering from regulatory anxiety. In fact I'd argue that of all the industries dealing with a stricter regulatory regime, the financial industry is by far the coziest with the regulators. The funny thing is, as I've stated here before, Krugman often makes legitimate points with regard to the pernicious concentration of power wielded by "organized money", but his insistence that some solution lies in placing yet more power in the hands of the very individuals (politicians) who empower those power-wielders is the definition of ludicrous. Krugman demonstrates time and again his unwillingness to look beneath the surface of his many assertions (I suspect he fears that what he'd find wouldn't sit well with his fans). And while this propensity secures his popularity, it, sadly, makes him .... well, read again my opening quote. The reason the market's been so volatile of late is obvious, it's because I'll be on vacation next week :(. And since I won't be around to comment on the goings on---to help you maintain a healthy long-term perspective on short-term developments---I thought I'd turn you over to some of today's regularly published pundits. Here are this morning's headlines followed, in italics, by my pithy perspectifying. Stocks will fall again, eventually, regardless of what the Fed does. And by the way let's hope to hell they do stay the course (that would be continuing to cut back QE), so the economy can correct whatever imbalances have resulted from all that "stimulus". Okay. That's one of those statements that I could do so much with I don't even know where to begin. No doubt the advice of a fully invested chap who's been predicting great things for 2014. Bullish, Bearish, Piggish, Shmiggish---a correction here regardless of the indicators would be healthy. Okay, then you should try to time the stock market. Yeah, that'll work. No doubt the words of a man who woke up this morning with a hunch... Well, shoot, I'd love to stick with that snide remark, but it's not fair to the pundit. His prediction comes from his in-depth analysis of where the market and its various sectors sit in relation to their 20, 50 and 200 day moving averages, momentum indicators, market breadth and the action in foreign markets. While I'm not big on technical analysis, I, being an advisor to long-term investors, do track the 200 day MAs for the various sectors we hold. And, yes, that is one of the indicators suggesting that the long-term trend remains intact. Although things can change in a hurry. Welcome Janet Yellen, now don't screw it up! I'd love to see Yellen continue the taper to invite further buying opportunities. This way, the next time the market continues another leg up over 16,000, the move will be au naturale and healthy, just like our recovering domestic economy. The market will tank now and again on any of an infinite array of possibilities. The secret to sanity is to maintain an asset mix that is consistent with your temperament (meaning one that won't incite you into panicky selling during the inevitable tanking) and your time horizon (the younger you are---the further away you are from spending your portfolio---the more volatility you can justify). So there you have it. Actually, there you have eight "it"s. Just pick the one you like (the last one, the last one) and stick with it. You're then free to focus on other things as the market meanders its way into the next week, the next month, the next year, etc. Q: The market got creamed the past couple of days. How come? A: Because some stockholders have decided to sell and buyers aren't willing to pay last week's prices. Q: Yeah yeah, we've had that discussion before. Just get to why the market's selling off. A: Oh, alright... If you believe the headlines it's because emerging market currencies have been getting whacked lately. Q: Okay, so why is that? A: While there are no doubt some country-specific issues involved, here's how I see things from a purely global perspective. Over the past few years emerging markets have seen monster inflows of capital, much of which came from speculators leveraging the Fed's ultra-easy monetary policy. The idea being that if the U.S. is going to print a trillion dollars a year, the dollar itself has to lose ground against certain other countries' currencies. So speculators borrow dollars at incredibly low interest rates then buy the foreign currencies they believe will appreciate against the dollar. If they're right and the dollar tanks against their currency of choice, they can make a bundle in a hurry. However, they're taking a bundle of risk in the process. If, say, the Fed looks to back off the money-creating, and the dollar looks, therefore, to increase against their currency of choice, they stand to lose a bundle as all those who were looking to exploit the same opportunity reverse their positions, thus killing the value of those other currencies. Add in a bit of utter stupidity on the part of foreign leaders who would institute capital controls (try to keep the money in the country) and you have the recipe for a nasty bit of selling. That's what's happening as we speak. Q: But you've been so positive on emerging markets. What are you thinking now? A: My optimism had/has nothing whatsoever to do with money flows inspired by the actions of central bankers. I remain long-term bullish based on some very basic facts. Such as: 85% of the world lives in emerging markets, younger populations live in emerging markets, infrastructure needs are extreme in many emerging markets, and lives are improving dramatically in many emerging markets. That said, the old risk/reward trade off (the higher the risk the higher the reward) exists in emerging markets like it does nowhere else. The potential reward is extreme, but, make no mistake, all manner of risk---market, political, inflation, business, currency---is extreme as well. You go there with a modest amount of your portfolio and you exercise patience. Q: So this selloff is all about emerging markets and it's nothing to worry about? A: No, I don't believe it's all about emerging markets, and whether or not you worry is entirely up to you. Q: So what else is going on? A: Well, recently reported earnings, while not horrible, have been a bit of a disappointment. I think that may have some folks rethinking 2014. Plus, a few recent economic data points have come in weaker than expected. Q: So do you think we're finally going to see that 10% correction? A: I know we're finally going to see it. Q: So this is it? A: Uh, I don't know, maybe, maybe not. Q: Is 10% as bad as it'll get? A: No, I think it'll get a lot worse. Q: So you're thinking this is the start of the next bear market? A: No, that's not what I'm thinking, although it's possible. What I'm saying is, there is no doubt in my mind that one day we'll see the next bear market. I just can't tell you when. Q: Do you think the market is expensive right now? A: It depends on what stock, what sector, what country, and what valuation metric you're looking at. There's the q-ratio that values stocks by dividing the price of the entire market by the replacement cost of every publicly traded company. By that measure, while it remains a long way below where it was before the tech bubble burst, the U.S. market's trading on the high side. If you're looking at P/E (price to earnings) ratios, stocks are historically okay here---unless interest rates spike and earnings don't. Q: So should I be worried? A: Like I said, that's up to you. I'd be worried a year from now if we don't get some sort of a correction this year. I think it's way overdue, but I thought that last year as well. Thank goodness we didn't trade that thought. Q: Should we be doing anything? A: Yes, we should continue rebalancing your portfolio a couple times a year. If the market continues to decline we'll be buying back to your target when it's time to rebalance. If it continues higher, we'll be selling, like we've been doing for the past few years. With a little sector-tweaking in the process. Q: So business as usual? To those of you who like to engage in ‘socially conscious’ consumption, here’s a partial list of companies that you might wish to boycott on the grounds that they are anti-poor. These companies, if this account is correct, are petitioning in support of raising the minimum wage – a policy that makes it illegal for anyone whose skill-sets are very low to work. Not only does such legislation deny these poorest of poor denizens of America opportunities today to earn income, it prevents these poor people from gaining the work experience and on-the-job skills that they would get by being employed. Such cruel and anti-social businesses do not deserve your consumer patronage. Your statement raises many questions. For example: if all employers would be better able to “stay competitive” by paying all of their workers wages above the current minimum, why do they not already do so? After all, you now pay such higher wages. Why do you suppose that your particular business plan will work equally well for other firms? Asked differently, why do you presume that other business owners are so inept that they’re leaving easy money on the table? If history is any guide, you – a business owner who supports a higher minimum wage – actually presume no such ineptness on the part of your competitors. Your support for raising the minimum wage is almost surely driven by your wish to increase your profitability by throttling your competitors. Good news for the stock market: We're out of the woods. That is, we're, for the moment, beyond any major political risk stemming from budget and debt ceiling battles in the U.S. (I'm guessing Congress will concede the debt ceiling next month with little more than a whimper). We're also, in my view, just beyond the risk that the Fed tapering its bond purchases (AKA quantitative easing [QE]) will majorly roil the stock market---although a strong wind could push us right back into those woods. We're, thus, beyond any near-term recession risk ("strong wind" caveat applies there as well), and if the IMF has it right the global economy (Europe even) will pick up a little steam in 2014. So, Whew!! Of course we can't forget what "out of the woods" essentially means---it means we've made it through a particular set of challenges. Perhaps, therefore, we should say we're out of the woods we were just in. And there's nothing about finding our way beyond one set of woods that keeps us from entering another. Which by the way we have. While it'll be refreshing, if I'm right, to not be so focused on Congress (at least till we approach the mid-terms this fall) and the Fed in '14, our eyes will be straining to see through the forest of corporate earnings (reported and estimated), of interest rates rising in response, let's hope, to a growing economy, of market valuations worthy of close scrutiny (earnings will need to handily beat expectations to justify today's valuations, particularly when interest rates begin to rise) and of a number of other potentialities that, if I were to address each one, would put you to sleep (if I haven't already). So I'll cut to the chase here and tell you what I see as one potentially big thing the stock market has going for it going forward: The fact that it's reached its present level while corporations worldwide remain perched atop trillions in zero-interest-earning cash. Companies have been able, either through cost cutting, accounting tricks or share buybacks---or all three---to report consistently improving earnings (justifying the bidding up of their share prices) for the past several years. Last year, however, was a year of multiple (as in price to earnings [P/E] multiple) expansion. Which means share prices grew at a substantially faster pace than did per share earnings. Now there's nothing horrible about that---as long as P/Es don't get ridiculously stretched (as they did in the late '90s), and as long as earnings growth accelerates a bit from here. Why is a pick up in the rate of earnings growth so essential at this juncture? It's because P/E multiples tend to contract during periods of rising interest rates. And multiples contract in one of two ways, as a result of rising earnings or of falling stock prices. Which takes us back to what I keep saying---for the stock market to withstand higher interest rates, higher interest rates have to come as a result of a faster growing economy. Please read Paul Krugman's article before continuing. The reality of rising income in America is encouraging. Since the late 1970s the lives of the bottom half of the workforce have improved measurably right along with the incomes of the top 1 percent, while "progressives"---amid a nation (top to bottom) full of cell phones and satellite TVs, Blue Rays and X-Boxes, microwaves and cordless mouses, and myriad etceteras and etceteras---dispute reality with statistics that merely measure the growth, lack thereof actually, in wages over the past few decades. That's right, even some economists, make that "progressive" economists, go there and insult the intelligence of every American with functioning eyeballs. They talk of "numbers", but never of notebooks. The numbers are their open invitation to bring out that age-old political weapon that, when deployed at the right moment---like when the economy is contracting, or growing slowly---works oh so well: that would be the inciting of class warfare. It's a determined campaign of optical obfuscation. At its cruder end this campaign comes close to outright falsification; at its more sophisticated end it involves using fancy footwork to propagate what I think of as the myth of middle-class stagnation. For examples of de facto falsification, one need look no further than the recent columns by Paul Krugman of the New York Times. Krugman revels in insulting every economist, and any(sighted)one else who would dare point his fellow citizens past the ends of their noses. The story goes like this: America's affluent are affluent at the expense of everyone else. "At this point", in his own words, "the rise of the 1 percent at the expense of everyone else is so obvious that it's no longer possible to shut down any discussion of rising inequality with cries of "class warfare"." He wields his bravado in such a way that you almost believe you've been, to this point, oblivious to the "obvious". Then you come to your commonsenses and realize that it is Krugman, never your eyes, that would deceive you---that what's truly "so obvious" is that folks on every rung of the income ladder are visibly better off today than they've ever been. O.K., that's what crude obfuscation looks like. What about the fancier version? Low– and middle-wage men and women lose ground across this era—a pattern interrupted only by the sustained growth, low unemployment, and minimum wage increases of the late 1990s. The growing wage inequality fed greater household income inequality (wages and salaries make up more than three-quarters of median family income) as those at the top received disproportionate wage gains. And the lessons are clear as well: Shared prosperity rests on policies and institutions (collective bargaining, a decent minimum wage, strong labor standards, etc.) that sustain the bargaining power of workers. In the absence of those institutions, only exceptional stretches of full employment have interrupted the failure of the wages, incomes, and living standards of ordinary Americans to benefit from the fruits of economic growth. I guess the "fruits" group doesn't include cell phones and satellite TVs. Not only is that fancy obfuscation, it's pure political genius (it makes voting victims out of non-victims). Although it should be viewed---in the face of present-day's ubiquitous amenities---as the most disgusting political manipulation. Oh, and A HUGE by the way, the Economic Policy Institute calls itself "a non-partisan think tank". Now note above the assertion that "Shared prosperity rests on policies and institutions (collective bargaining, a decent minimum wage, strong labor standards, etc.) that sustain the bargaining power of workers." Hmm... "collective bargaining", "labor standards", "bargaining power of workers"...Hmm... smells a little fishy. I wonder who chairs the board of the EPI? Let's click on the Board of Directors tab and see. Ooookay, now it's making sense: The chairman of the (cough cough) non-partisan Economic Policy Institute is---you ready?---none other than good old Richard Trumka, President of the AFL-CIO!! And this would be Krugman's idea of a credible source. Oh my!! So then, how can the myth of middle class stagnation be sustained? Mainly through a strategy of distortion by dilution. You almost never hear class warmongers talk about the glaring contrast between life in the 70s and life today. Instead they talk about "real wages". This may sound like an innocent choice, but it's not, because it misses the miracles of virtually all manner of technology stemming from a system that rewards the inventors, innovators and distributors of those miracles. Think of it this way, the fortunes (okay, the wages) of those who deliver the goods and services that allow the rest of us to enjoy so much more wealth per dollar earned (that would be "shared prosperity") will of course grow faster than the wages of the rest of us---as they should. And who are these lucky few? Mainly they're executives of some kind, especially, although not only, in finance. You can argue about whether these people deserve to be paid so well, but one thing is clear: They didn't get where they are simply by being prudent, clean and sober. While the finance industry has no doubt played an essential role in the development of the material miracles highlighted above, I do deeply share the frustration that many (not all) of those who were so instrumental in the inflating of the real estate/mortgage backed securities bubble walked away, wealth intact. What is utterly amazing, and unconscionable, is that the likes of Krugman would have us place yet more power in the institution (the Federal Government) that fed those fat cats the fruits of other people's labor. Oh my!! We clean our own office---uh, actually, the staff cleans our office. Seven years ago, when we moved in---when we left the parent company and struck out on our own---my partners and I assumed we'd hire a cleaning service to tidy up the place at the end of each day, like the old company did. Well, after receiving a few quotes---to clean our moderate-sized facility housing nine individuals---we scratched our heads in puzzlement (seriously we each sat there scratching our heads). While I can't remember the exact numbers, suffice it to say that hiring a maid-service made no sense to us. As it stands the place always seems to sparkle, and I don't even know when Gladys and the gang gets to it (the bathroom, btw, is out in the common area and not our responsibility). Yeah, I know, my bad. You'd think an investment consultant, business owner who writes on the economy would have thoroughly explored the question of productivity---of having handsomely-paid staff perform menial labor. As you'll see in a second---not that this answers the productivity question---we have unusual staff. Now, let's say there's a teenager living in the apartment complex down the street who could use a few extra bucks for himself, or to help his parent(s) make ends meet. How refreshing would it be for the young fella to garner the courage to walk over to our complex and knock on a few doors? He might wander into our office and inquire as to whether we'd consider hiring him to clean up the place a few days a week. I'd have to ask Gladys to know for sure, but I'm guessing that---to do a job worthy of remuneration---it'd take one person at least 3 hours each time. Beginning this July 1st, the minimum wage in California will be $9 per hour. It's currently $8, but knowing that it's about to become $9 (then $10 on January 1, 2016), I'm calculating $9. So, assuming 3 hours a day, 3 days a week, we'd be spending (forgetting payroll taxes to keep it simple) about $350 a month (roughly $400 come 1/1/16). Actually, that doesn't sound half bad. However, knowing Gladys (my admin assistant/office manager for the past 20+ years) she'd tell me "NO WAY!" (she's remarkably responsible with her employer's money, and she's not to be crossed). She and the rest of the staff seem to have a system that works (and there's no cleaning a bathroom), and nobody's complaining. Now, what if we and the unemployed teenager were unshackled by the minimum wage law? What if he came a knocking and opened negotiations with, say, a $9 an hour offer? Being that I'd have no choice but to have Gladys handle it, $9 would be a definite no, as would $8, and as would, I strongly suspect, $7. But when we get to $6 or $5, and Gladys starts thinking what else she and the others might be doing with whatever time they spend cleaning, the young man just might have a shot at making a few bucks and, more importantly, knowing what it's like to have a job, to learn responsibility, to take pride in his work, in his tenacity, in his self-sufficiency, to learn how to deal with a tough, hard-nosed boss (that would be Gladys), etc. I'm seriously getting goosebumps as I type! But, damn!, reality just set in. It's not going to happen. Not because there's no willing teenager next door---not because there's no price low enough to get Gladys's attention---but because one of the most discriminatory laws on the books entirely destroys the opportunity. It's utterly shameful! I know what you're thinking, fast food. That's what I did after school (Der Wienerschnitzel) my junior year for something like $2.75 an hour. And there is a Taco Bell just around the corner. A Taco Bell with a franchisee who, I assure you, is trying to figure out how to handle the coming increase in his labor costs. My little example here is the kind of situation studies---the ones, that is, promoted by proponents of raising the minimum wage---altogether miss. They're not looking at firms like ours whose employees earn way above minimum wage. Firms that might indeed, for the right price, bring in a part-time unskilled worker. They're not considering (or not disclosing, or they're explaining away) the fact that while the nearby Taco Bell franchisee may (let's hope) find other ways (other than laying off workers) to compensate for the hit to labor costs---the odds of that needy, unskilled, unemployed teenager getting hired on will diminish have diminished (California's already done it) greatly. Again, it's utterly shameful!! Good news for stock market bulls this week: The American Association of Individual Investors sentiment survey shows a reduction in bullishness---to 39% from the recent high mark of 55%. Bearishness however has only risen from 18% to a still-low 21%. Which means the move in sentiment has been primarily from bullish to neutral. I suggested the other day that the, albeit very slight, downward volatility in early January might bring sentiment down a bit. The fact that it has tells me that folks remain jittery, and that's a beautiful thing if you hope for a continued rise in the market. Bull markets are born on skepticism, grow on pessimism, mature on optimism and die on euphoria. There will always be bull markets followed by bear markets followed by bull markets. Which means, next up is a bear market. The question is, are you feeling euphoric? What are the issues? What are the polls saying? Seems like inequality is a hot button. Minimum wage. Helping the poor. Middle class stagnation. What's our strategy? Whose support can we buy? Of course you know where this is headed. Yep, it's an election year. Politicians will be doing what they do 100% of the time, yet with greater brashness. And of course the media's there to oblige. I just read Charles Blow's NY Times OP-ED titled Pro-Progressive Is Better Than Anti-Christie. I think he titled it before he wrote it. I can relate---sometimes you start writing, thinking in one direction, then your writing takes you elsewhere. From the title I figured I'd read a piece on how "progressives" ought to focus on their worthwhile issues. Save for his last paragraph, however, Blow---after recommending a pause for the evidence before condemnation on Bridgegate---devoted his message to labeling Chris Christie a needle-threading flip-flopper. And, you know, I'm sure he's right. That's right, despite having paid very little attention to the New Jersey governor, I have no doubt that Blow has hit the nail right on Christie's head. How can I say such a thing? You ask. How can I agree, without the evidence, that Christie's a flip-flopper? You're kidding, right? Shoot me an email, if that's truly your thinking, and give me 10 minutes, I'll shoot you back enough links to keep you up till midnight (and I'd be starting completely from scratch). C'mon, he's a career politician! We've been to this Republican sock hop before --- in 2012 with Mitt Romney. Of course he accurately nailed Romney as well (I wrote on that myself). But the thing is, Blow has the gall to call out Christie and Romney, and make reference to Republicans' preferred dance genre, while suggesting that this gives "progressives" some political advantage---as if "progressive" politicians don't cuff their jeans and flip flop all over the dance floor as well. My goodness!! If a 2.3% surtax is a threat to small companies, what do you think a 38% hike (going to $10) in the minimum wage (let alone Ms. Warren's number) would do to them?? Here's Harold Meyerson in today's column, Free Trade and the Loss of U.S. Jobs ,worrying about President Obama's self-negating act of bemoaning rising inequality while promoting a free-trade agreement. Trade agreements that promote the relocation of U.S. corporations’ factories to nations like China and Mexico have played a central role in the evisceration of American manufacturing and the decline in U.S. workers’ incomes. Two out of three displaced manufacturing workers who got new jobs between 2009 and 2012, the Bureau of Labor Statistics reports, experienced wage reductions — most of them greater than 20 percent. Two out of three displaced workers took lower-paying jobs. Okay, but let's ponder for a moment what else resulted from the relocation of U.S. factories. For sure, U.S. consumers benefited directly from lower cost goods---freeing up income to enjoy elsewhere (like with local, people-employing, merchants) and to save and invest (providing capital for the expansion of job-producing U.S. businesses). Also, for sure, U.S. exporters (employers) benefited from the investment of U.S. dollars those relocating U.S. corporations made abroad (only someone desiring U.S.-made products and services would trade for green-colored paper claims against U.S.-made products and services). One more: What is all too often overlooked is the fact that a major reason U.S. factories relocate abroad is to more efficiently serve those markets---remember, we're merely 4% of the world's population. Investments made in serving the markets---and improving the lot---of those whom we trade with ultimately come back, manifold, as those folks evolve into future customers for U.S. businesses, and, as importantly, suppliers of whatever future goods and services will be best produced on their shores. And, besides, what are the chances that the next world-changing genius will be born on American soil, 4% (I suppose a little higher given our resources)? Shouldn't we, in the PRIVATE SECTOR---for our own future's sake---be doing everything we can to engage our kids' and grandkids' future business partners? The benefits of protectionism are easy to see because they're showered upon select, identifiable, individuals: The BLS, for example, was able to track manufacturing workers from '09 to '12. Had their previous employers lacked the freedom to relocate those factories, they might still have their old jobs. The costs, on the other hand---the individual not having the discretionary income, the small local businesses not seeing the extra business, the budding entrepreneurs not seeing the added investment, the exporters not seeing the growth abroad, and our future trading partners not having the opportunity to grow better lives and become greater contributors to the world marketplace---while colossal, are less visible, diffuse, and, therefore, incalculable. The economy picking up will result in higher long-term interest rates. That could be a good thing for banks, in that---assuming short-term rates remain low---they'll access money very cheaply and lend it out at higher rates: If loan demand doesn't wane with higher rates, that bodes well for margins. However, higher interest rates will bring equity valuations into question (price to earnings ratios tend to expand in low-rate environments and contract as interest rates rise). Earnings, in that event, will definitely have to improve to justify present, or higher, stock prices from here. Meaning higher interest rates have to be the result of a better economy, resulting in higher corporate earnings. If they come as a result of investors fleeing the bond market out of fear of higher rates (for example), that would be bad news for the stock market. Ten percent corrections have historically been annual events. Last one, however, occurred in the fall of 2011 (over 2 years ago). Everyone says we need one, but just wait till it happens. While 10% may not sound like much (because it's not), we're talking roughly 1,640 Dow points from here, which would take us back down to spring 2013 levels ---and fall 2007 levels (almost) before that. That'll feel terrible to a lot of folks, except of course those who've been waiting suffering (big-time) for that event before finally getting in. Speaking at a news conference designed to relaunch his presidency thatlike France's economyhas been stuck in the doldrums, Mr. Hollande said he would tackle France's chronically high payroll taxes, addressing a long-standing demand of French business leaders. Mr. Hollande is striving to repair relations with France's business community, which has voiced anger about climbing taxes and alarm that the euro zone's secondlargest economy is losing ground to Germany. Since his election in May 2012, Mr. Hollande has relied largely on tax increases to fix France's finances with only marginal efforts to pare expenditures. The economy has barely grown since he took power while unemployment has risen. Business leaders say this has hampered their efforts to compete internationally. France stands out among European peers for its relatively high labor costs, which eat into profit margins necessary to invest and recruit. For nonfinancial corporations in France, gross profit sharea standardized measure of profit marginsstood at just over 28% at the end of 2012, compared with 38% in the wider euro zone and 40% in Germany, according to Eurostat. "How can we run a country if entrepreneurs don't hire?" he said. "And how can we redistribute if there's no wealth?" By the end of his mandate in 2017, Mr. Hollande said, French companies will no longer be required to foot the 35-billion ($47.9-billion) annual bill for France's generous family welfare programs. He said he planned to fund the tax cut by slashing government expenditures, a departure from his previous practice of forcing consumers to bear the burden through high sales tax. The overture to French companies risks fueling tensions within Mr. Hollande's Socialist-dominated majority in parliament and angering the country's unions. "He's turned his back on workers," the left-leaning CGT union said in a statement. Click the play button below for today's commentary. If the player doesn't work on your device, please email me at marty@pwadvisorsinc.com and I'll send you the audio file. When is it yes? When the money's on the Fed---and when "the money" is short-term money. A good economy means less accommodation from the Fed, therefore, traders who've bought thinking others are buying because the Fed is printing uh, typing, will back out of the market on data (a pick up in economic activity) that would inspire the Fed to back off. When is it no? When it's clear that the economy has broken free of whatever's been shackling it and the short-termers have had their reaction (think last year's selling on taper-talk). A growing economy means growing business and growing earnings. And growing earnings---at a pace that exceeds priced-in expectations---means higher stock prices. It also means, however, higher interest rates. Which will, I suspect---aside from the usual politics---pose the biggest challenge for the market in 2014. If, however, the 2014 stock market is not tested by higher interest rates, it means that the economy hasn't yet broken out of the muck, which means, alas, another year of traders trading taper-talk and you and me assessing guessing what the longer-term ramifications of rampant money creation will be. Early last week CNBC devoted a good fifteen minutes of the Closing Bell show to a young freelance writer whose recent Rolling Stone article has gone, according to the show's host, viral. I listened to the young man and then went ahead and read his article. While I heard myself say "Wow!" a few times while reading, I concluded that those five economic things millennials should be fighting for were far too, frankly, farcical to devote even a paragraph to herein. Yes, condescendingly, I chalked it all up to his mere nine years of emancipation and the influence of his present surroundings. Furthermore, there is strong evidence that antipoverty programs have long-term benefits, both to their recipients and to the nation as a whole. ---without the merest mention of studies (here's one, here's another) that don't play to his prejudice. For a long time, everyone knew — or, more accurately, “knew” — that the war on poverty had been an abject failure. And they knew why: It was the fault of the poor themselves. But what everyone knew wasn’t true, and the public seems to have caught on. The narrative went like this: Antipoverty programs hadn’t actually reduced poverty, because poverty in America was basically a social problem — a problem of broken families, crime and a culture of dependence that was only reinforced by government aid. And because this narrative was so widely accepted, bashing the poor was good politics, enthusiastically embraced by Republicans and some Democrats, too. Yet this view of poverty, which may have had some truth to it in the 1970s, bears no resemblance to anything that has happened since. About four decades ago, most of the children S.S.I. covered had severe physical handicaps or mental retardation that made it difficult for parents to hold jobs — about 1 percent of all poor children. But now 55 percent of the disabilities it covers are fuzzier intellectual disabilities short of mental retardation, where the diagnosis is less clear-cut. More than 1.2 million children across America — a full 8 percent of all low-income children — are now enrolled in S.S.I. as disabled, at an annual cost of more than $9 billion. That is a burden on taxpayers, of course, but it can be even worse for children whose families have a huge stake in their failing in school. Those kids may never recover: a 2009 study found that nearly two-thirds of these children make the transition at age 18 into S.S.I. for the adult disabled. They may never hold a job in their entire lives and are condemned to a life of poverty on the dole — and that’s the outcome of a program intended to fight poverty. Most wrenching of all are the parents who think it’s best if a child stays illiterate, because then the family may be able to claim a disability check each month. This, ladies and gentlemen, is why we cannot ignore the likes of Paul Krugman. His utter lack of objectivity, as he perches high (in the public eye) among "progressive" economists, means we cannot discount his rants as we do the useless ramblings of a Jesse Myerson. They are inherently dangerous, particularly---in the most recent instance---for the poor. Congressman Devin Nunez is pushing hard for the fast-tracking of a couple of "free trade" agreements that he promises will do wonders for the U.S. economy. He stresses that these "historic trade agreements"
would dramatically boost economic growth by integrating America in free-trade zones incorporating about 65 percent of the world's economy. As America's second-largest exporting state, California would be a major beneficiary of these agreements. There would be more business for our small manufacturers and service providers, increased traffic through our ports, new customers for Silicon Valley technology, and more exports of dairy goods, nuts, citrus and other agricultural goods. While perhaps we should praise Mr. Nunez for his efforts, it's clear in his message that he suffers from the age-old misconception that the benefits of free trade lie primarily in the exporting (and/or he benefits from the age-old politician's-penchant for cozying up to exporters). And that gross misconception (and cronyism) is what gets in the way of yours and my freedom to buy the goods we desire at the world's most competitive prices. Sure, exporting's a wonderful thing when you're an exporter. Ah, but when you're an everyday American consumer (especially the low and middle-incomers politicians profess their concern for), the beauty of trade lies in the importing. The bringing to your doorstep the wealth of affordable goods the outside world has to offer. In fact, as Milton Friedman explains crystal clearly below, we'd be far better off if we'd simply allow the American consumer the freedom to purchase whatever goods or services he desires from wherever under the sun he finds the best value for his money---without any regard whatsoever for the protectionist policies of the nations where his suppliers reside. Mark Zandi and a whole herd of other economists say "throw today's jobs number out!". Which means their predictions were way off the mark (the consensus had 195k new jobs in December, the number came in at 75k. OUCH!!). Stock trader Jim Cramer says "don't dismiss today's jobs number". Cramer goes on to say that stocks trade on interest rates and, therefore, the hugely under-consensus-estimate jobs number is good news for stocks, particularly homebuilders. Meaning, he likes numbers that, in his view, help the stock market. Was it bad weather? Perhaps. But what about the 238k December ADP number released on Wednesday? Cramer says this is why that (ADP) number is worthless. I wonder which number he'd consider worthless if the release dates were reversed and the market rallied on the ADP number? So anyway, does the fact that stocks opened higher mean that bad economic news remains good news because it keeps the Fed buying bonds? That was more or less the excuse proffered in the headlines. However, I was watching futures before the number was released and the Dow was looking to open 70 points higher. That gain quickly dried up on the news. Then, as we neared the opening bell the market began to move a bit higher. So, is it that bad news remains good news, or is it that traders buy the miss-calculating economists complete disregard for December's miserable employment report? I think I'm moving away from the bad news is good news opinion. However, the spike higher in emerging markets stocks this morning suggests to me that those markets remain correlated (short-term) to the prospects for continued QE. So we'll conclude that, for the moment, bad news is no longer good news for U.S. stocks, but that's not necessarily the case globally-speaking. That's why diversification is everything. As I close, the major U.S. averages have dipped into negative territory. Believe me, if bad news were good news (for the U.S market), they'd be up big time. If you were a U.S. producer of some essential good, how would you feel if---due to an export ban---you couldn't market your product to would-be customers willing to pay you the market price? If you, U.S. citizen, were in need of a job, how would you feel about a ban on an essential good that, if lifted, would inspire the U.S. producers of that good to expand aggressively---putting you, and thousands of others, to work in the process? How would you, U.S. citizen, feel if your local producers of an essential good, with the capacity to produce it in such great quantity so as to not only supply you, but folks abroad as well---due to an export ban---didn't? Essentially forcing producers to keep supply low enough to keep the price (that you pay) high enough to remain profitable. How would you, U.S. consumer of goods produced abroad, feel if---due to an export ban---the producers of goods from abroad were denied access to the global supply of some essential input, forcing their cost of production higher and, therefore, the price you pay for the desired good higher than it otherwise would have been? If you were a U.S. exporter of anything, how would you feel if---due to an export ban---your customers abroad lacked access to the global supply of some essential good, resulting in higher prices for that good (and, therefore, less spendable income) for them, and less business for you? If you were a non-U.S. consumer/producer, how would you feel about a trading partner who has control over the production of some essential commodity that you are in need of---and that you are eager to pay the market price for---and that "partner", out of some unfounded fear and/or to benefit some select group of political supporters, refuses to sell it to you? Would that strain your business relationship? Might you, in retaliation, play the same sort of game should you find yourself with a surplus of something that that "partner" may need in the future? Folks, these are a few of the questions that might arise when we look beneath the surface of the export ban on crude oil that will be debated in the weeks and months, maybe years, to come. I assure you, any arguments for justifying the continuance of the 40 year-old ban, while they'll be cloaked in concerns for the U.S. consumer, will be made on behalf of politically-connected special interests. Of all the political blunderings that serve to hamstring our economy, not to mention---and most importantly---our liberty, I can't think of any more pernicious than protectionism. It was the best of times, it was the worst of times... 2013 that is. 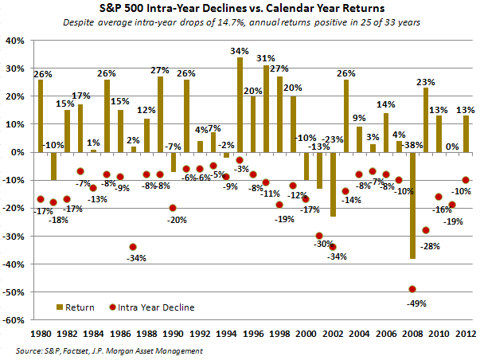 If you're a long-term thinking, all equities investor, 2013 was the best of times. If you're a long-term thinking, balanced portfolio investor---and "balanced" means bonds (along with stocks) occupy a good chunk of your portfolio---it was a decent year. If you're a long-term thinking, thinking you're conservative, investor and you had all of your money in bonds, it was the worst of times---you're not supposed to lose money when you're conservative. If you're the average hedge fund manager, while you're probably still one of the richest blokes in the country, 2013, like 2012, 2011, 2010 and 2009, was a rough year for you---in that those clients who pay you 2% per year plus 20% of their earnings expect you to outperform the average Joe who simply throws all his long-term money at the S&P 500 Index. The average hedge fund, for all the resources its manager(s) brought to bear, eked out a 7.4% return in 2013 against a 30% gain in the S&P. Ouch! Both sides in Washington were gearing up for round whatever of their fiscal (budget/debt ceiling) fiasco of a fight. The Fed wasn't yet signaling an end, or a beginning to an end (a tapering), of their amazingly generous, to Wall Street, quantitative easing (QE) program. Meaning they were still pessimistic on the economy. The Fed was signaling that it would keep short-term interest rates low until all the ice caps finally melt. Also meaning they were still pessimistic on the economy. Stocks looked relatively cheap by conventional valuation measures. There was a generally bearish tone toward the market (hence the plight of the hedge fund [they bit] in 2013). The Fed broke the ice last month and announced a $10 billion tapering of QE. That was a hurdle that needed jumping. The "market" should expect more of that this year, particularly if today's 238k ADP jobs number is a harbinger of things to come. The Fed remains committed to keeping short-term interest rates low until coastal California is under water (literally). Stocks, while not---in my view---dangerously expensive, are no longer cheap. According to surveys that track individual investor and investment adviser sentiment, there's a very bullish tone going into to 2014. Washington: The market is, for now, numb to short-term political wrangling. It's their long-term "successes" that we should concern ourselves with---more on that later. The Fed: Thank goodness they've begun to slow the "printing" (they don't actually print it). We should expect more tapering going forward as long as the economy continues to improve. The improving economy should temper big potential reactions (selling) to future tapering. Stocks and Bonds: The market should like the Fed's commitment to low interest rates until you head to Vostok to get a tan. However, I expect we'll see the yield curve steepen further (long rates rising while short-term rates remain relatively low), which means more bad news for bonds, and a potential headwind for the stocks of companies in the more interest rate sectors of the economy. Stock valuations: While, again, stocks aren't cheap, an improving economy should translate to better top-line growth for a now-efficient corporate American (and world), which translates to better earnings going forward. A better macro environment could also mean gains by way of multiple expansion---a fancy way of saying stock prices could increase faster than do earnings. Sentiment: If I were a short-term investor trader, this one would bug me a lot. Too much bullishness is ultimately not a good thing for stock prices. I.e., who'd be left to buy the dips if everybody's already in the market. So you might say, on balance, that things look pretty good going into 2014. Okay, but that in no way spells another banner year in the making---remember, the January 2013 picture was anything but rosy going in and the market saw its best year since 1997---i.e., don't predict. My prediction (I know, I just said don't): Based on what I've discovered during my painstaking, in-depth analyses, I fully expect that the market will end 2014 either higher, lower or about where it is right now. I'd bet money on it! While Harold Meyerson, in yesterday's Washington Post, so exposes his utter ignorance on a number of fronts---his suggestion that racism is somehow rooted in the opposition to raising the minimum wage (economists Walter Williams and Thomas Sowell suggest the opposite below) and his promoting protectionism to name two---he hits the nail on the head with the title of his article: "Wage Boost Could Pay Democrats Dividends". While, I assure you, this was not his intent, in titling his article Meyerson gets to the heart of what inspires those policymakers who push for raising the minimum wage---political dividends. So here's how a free market for, I don't know, say, light bulbs works: Smart consumers look to get the most for their money. Light bulb makers, battling for the consumer's business in the open market, will hire the brightest minds to devise a better bulb---that they can sell at a profit---ahead of the competition. If one introduces an energy-saving bulb that management believes customers will pay up for, and they turn out to be wrong, it's back to the drawing board. Competition is a beautiful thing, it assures that you and I get the absolute best of what modern science can profitably deliver. Sadly, that's not all too often how it plays out. Here's how it indeed all too often plays out: Bulb maker hires bright minds to invent an energy efficient, profit-producing, bulb, which they---in terms of energy efficiency---do. Smart consumers don't buy them---they just don't pencil. Rather than going back to the drawing board and inventing a legitimate product, light bulb makers put their millions behind regulations that would eliminate the old, less-profitable, bulbs. Result: cronies (bureaucrats and businessmen) gain politically and monetarily, consumers lose money and liberty. *Banning whole milk because non-fat is better for the consumer. *Banning regular beer because light " " "
*Banning regular chewing gum because sugarless " " "
*Banning white bread because whole grain " " "
*Banning thin-soled shoes because cushioned are " " "
*Banning you name it because some substitute is " " "
Think me ridiculous? Really? Think again: Our no-brighter-than-you-and-me elected officials---at the behest of their sponsors---have determined that we consumers need further limitations they need more control over our personal choices (save for recreational marijuana use in Colorado, gender-identity bathrooms in California, and I presume a few other bestowments) to the tune of some 40,000 newly enacted laws in 2013 alone. Tuesday's guest on CNBC's Fast Money program made a case for the first 5 trading days of 2014 being huge for January, and for the trend in January being huge for the balance of the year. According to him, if the S&P 500 is up the first five days, there's an 80+% chance it'll show gains for the month. And if the S&P 500 is up for the month, there's a better than 70% chance the index will end the year higher than where it began. And, believe it or not, this well-known analyst (not in the mood to pick on him by name) was dead serious. Even one of the show's regulars (the show features a small group of traders offering up their stock picks) acknowledged the so-called January effect as a legitimate indicator. Oh my! Long-time readers know that I'm no big fan of technical analysis. In my mind, shapes drawn by lines tracking some data point matching similar shapes from some number of decades ago says virtually nothing about what the market's going to do in the morning. In fact I just finished a book yesterday, written back in 2009, that featured interviews with a few top strategists. One gentleman, a well-respected analyst, painted an utterly frightening picture of the ensuing 3 - 5 years based on striking similarities between the stock market of the 1930s and that of 2008. He predicted, with conviction, that it would take many years for the market to eclipse the high it reached during the 2009 bounce, let alone the all-time high it recorded in the fall of 2007. Well, as you know, the market has, four years hence, blown by both of those milestones. Again, I'm no big fan of technical analysis, that said, I do find some of it intriguing. The fact that so many big-money managers strategize with technicals makes me interested in the most-used schemes. While maybe I can't get my brain around how so many brainiacs find value in shapes that were drawn at, in my 1930s example, times when the then players are now dead, the fact that they can is something I should pay attention to. Regardless of why they may think that when a security drops below its 200-day moving average it's time to sell, if they all sell, their prophecy becomes self-fulfilling. Liberals across the country are looking to Bill de Blasio, who was sworn in as mayor early Wednesday, to morph New York City’s municipal machinery into a closely watched laboratory for populist theories of government that have never before been enacted on such a large scale. The elevation of an assertive, tax-the-rich liberal to the nation’s most prominent municipal office has fanned hopes that hot-button causes like universal prekindergarten and low-wage worker benefits — versions of which have been passed in smaller cities — could be aided by the imprimatur of being proved workable in New York. “The mayor has a remarkable opportunity to make real many progressive policies and prove their merit,” said Gavin Newsom, the lieutenant governor of California. I'm thinking that perhaps this sort of lab experiment is what this country needs right about now. Sadly (for those who'd like to see such an experiment play out. Not, ironically, for NYC residents), however, the Mayor can't arbitrarily implement all the promises that won him the election. Clearly, he won't get it all done, which is probably the best thing for his political career: as George Will suggested the other day, Justice Roberts did President Obama no political favor by saving the Affordable Care Act. And I suspect De Blasio isn't quite that ignorant anyway---in fact I suspect the opposite: A successful politician knows how to promise the moon---knowing that the moon's out of reach---and knows that he can blame his opponents for sabotaging a mission that would have landed his starry-eyed followers on the most desolate soil (he'll have them believing the other side stole them from his make-[them]-believe land of milk and honey). So, while, along with personal liberty, employment (of the very folks who he's there to "help") in New York City will surely suffer at the hands of its new mayor, I don't know that we'll get to see many progressive policies "prove their merit". While there’s plenty in terms of geo-political risk to concern ourselves with at present, the future holds as much promise today as it has at any time in history. Yes, mistakes, particularly mistakes of policy, will be made. And yes, such mistakes will deliver hurdles and setbacks in the years to come. And yet future generations will witness the advancement of the human condition in ways we can’t even begin to imagine. The ultimate pace of that advancement will be determined by the extent to which we possess the freedom to pursue our individual objectives, and the freedom to conduct business in the global marketplace going forward. Near-term, I remain cautious. Long-term—bumpy roads notwithstanding—I remain wildly optimistic.